This delightful angel vine topiary star sculpture is the perfect addition to any indoor and outdoor display. Angel vine is a unique, prolific vining plant that will grow around the provided star shape and sprawl underneath the tree form for a sophisticated, timeless look that is an inviting addition to any room in the house or garden. Live topiary plants are custom crafted, live plant decorations that are easy to maintain and are beautiful on their own or in groupings of multiple, differently sized topiaries. Topiaries add an air of elegance to any room and may be kept potted indoors or planted outdoors. This fresh topiary display is shaped into a tree capped with a stunning star form that is covered with fresh green ivy that will grow around the sculpture and in the pot. It is potted and may be arranged a variety of ways including in foyer displays, outdoor arrangements and more. Add bows or flowers to round out this beautiful display. These living sculptures are a tasteful addition to any décor and are ready to display upon delivery. Simple to care for, this topiary makes a wonderful gift for anyone in your life! Buy one for yourself and surprise a friend with one too. This whimsical live sculpture is a perfect statement piece on tabletop arrangements, porch displays and more. This is a unique and stunning display of an angel vine live topiary plant, gently trained to surround a lovely rustic star shaped frame. Together with a perfectly decorative bow, this topiary plant will be a wonderful addition to any indoor area. The angel vine plant, also known as mattress vine, has been traditionally found as a very fast growing, dense ground cover outside. 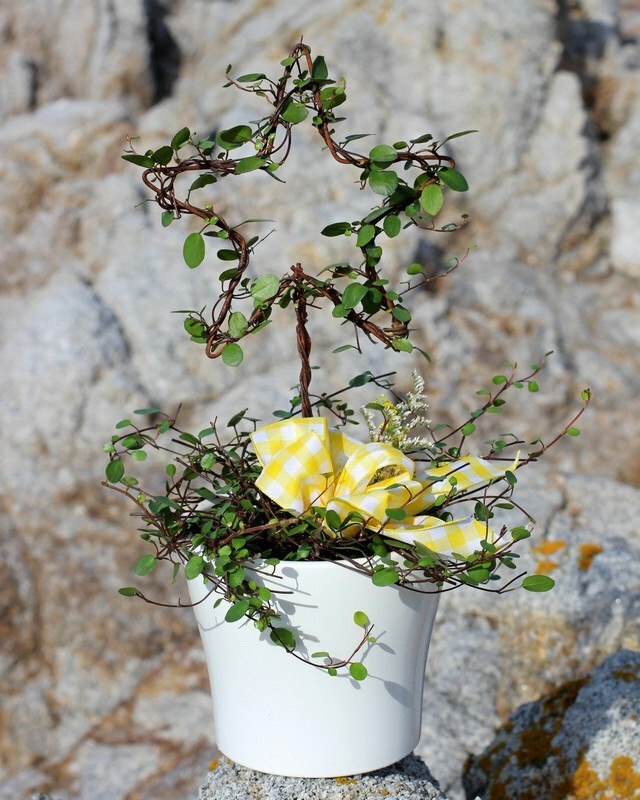 Its light airy leaves grow on wiry stems that make it perfect for use in live topiary. The angel vine was originally a Mediterranean native plant, and is able to withstand warm or dry temperatures. It is very forgiving in terms of care, as it is a deceptively durable plant. It looks more delicate than it really is. As long as proper care is given even occasionally, this live vine topiary will grow successfully in your home for a very long time. The fresh topiary requires enough water to keep the soil moist during warmer conditions. The stems can become wiry as they age, but proper pruning will both help keep its shape intact and keep the stems appearing delicate. This live topiary enjoys brightly lit areas, although not direct sun. Enjoy the delicate beauty of this angel vine topiary plant in your own home, or as a gift for a friend. Care: Angel vine topiary is easy to care for and does well in most environments. Keep soil evenly moist, but not wet. Check the soil daily. Exposure to bright, indirect light is recommended, and an ideal temperature is around 40-80° F. The topiary weight is 1 lb. The pot is 4.25 inches in diameter. Trim leaves back to maintain the shape of the topiary.